Can a new government turn the tide in Honduras? Violence, poverty and an unaccountable government are dangerous ingredients of a potential nightmare scenario. Unfortunately, Honduras has them all. And that seems unlikely to change in the foreseeable future. Honduras held general elections last week, the first ones since the 2009 coup d’etat against President Manuel Zelaya. Unlike most American countries, the US supported the new government and allowed coup-leader Roberto Micheletti to rule until new elections were held. The modest gains in the economic and social realms under president Zelaya have been since been reversed, and the overall political situation has worsened. At the moment, Honduras is the deadliest country on Earth. According to the 2011 report by the United Nations Office on Drugs and Crime, Honduras has the highest homicide rate in the world ( 82.1 per 100,000 inhabitants). 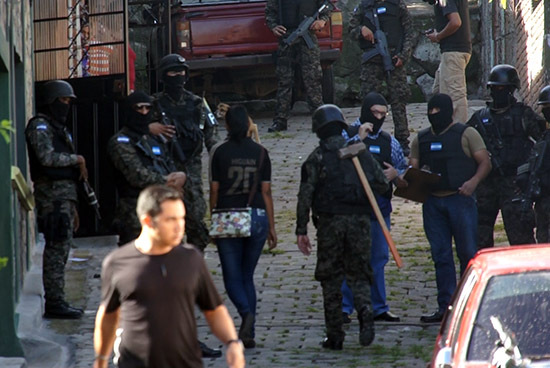 A report by the Violence Observatory at the National Autonomous University of Honduras (UNAH) states that homicides in Honduras reached a record high in 2012, leaving a total of 20,152 deaths since 2009. While it is true that violence started to skyrocket during Zelaya’s presidency, it is worth noting that the harsher measures that the replacing government implemented -and which have earned it several denounces for human right abuses- have done almost nothing to tackle it. This violence has been cultivated in a petri dish of widespread and persistent poverty. Honduras is the second poorest country in the Western Hemisphere, just behind Haiti. Despite a sharp decrease in poverty since 2005, World Bank figures reveal that ever since the coup occurred, poverty has increased back again. Likewise, GDP and unemployment figures have worsened, according to the IMF figures. In turn, outgoing President Lobo has bet on a stringently neoliberal platform. His capstone project, “Honduras is Open for Business”, seeks to please foreign investment, hoping to entice them towards overlooking an atmosphere of violence and corruption. Contrary to the trend in Latin America, the new laws will “guarantee capital repatriation, access to foreign currency, equal treatment of the assets of nationals and foreigners, patent protection, and a ban on land expropriation.” These type of terms were exactly what earned Honduras the original title of “Banana Republic” many decades ago. Now, amid irregularities and protests of fraud, a new government has been elected. 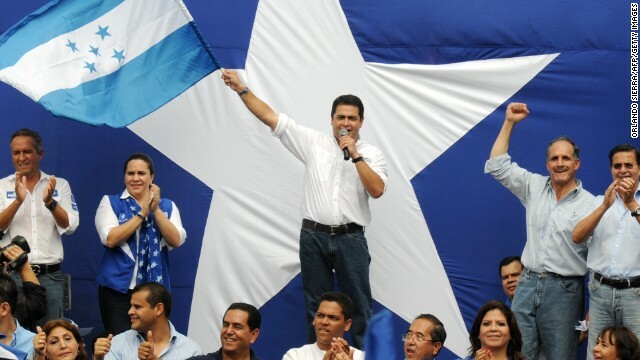 President-elect Juan Hernández built his campaign on security, promising to put “a soldier on every corner” in order to tackle Honduras’ security crisis. Before becoming the presidential candidate of the conservative National Party, Hernández, was President of the National Congress of Honduras. As such, he oversaw the legally dubious appointment of a new attorney general. With reduced accountability, it is hard to believe that the new government will deliver on its promise to improve the situation, especially when the police top members are involved in cases of crime, torture and other human right violations. 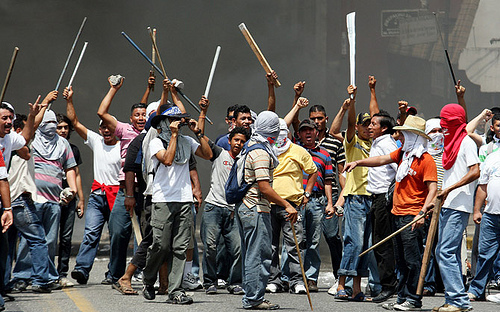 This crisis of representation is well embedded in Honduras’ population. According to Latinobarómetro, a public opinion survey carried out in all Latin American countries, the very answers from Hondurans may tell more than many analyses out there: to the questions on how much support and satisfaction there was with democracy in their country, Hondurans’ responses put the country in the lowest three places, whilst regarding on how much the president and government were trusted, the Central American country has the lowest registered levels of trust in the region. In all, Honduras’ future, if uncertain, appears bleak. Events such as the formation of the runner-up LIBRE party that aims to integrate dissidents seems to give fresh air to a political arena historically dominated by two parties prone to serve the status quo. Nevertheless, we all should be aware that solving Honduras endemic problems of democracy, security and poverty are still a long and arduous path. Obama in the Americas: Change, or More of the Same? This entry was posted in Mexico + Central America and tagged Honduras, honduras presidential election, Honduras violence, Juan Hernández, Juan Hernández Orlando. Bookmark the permalink.